1954 Topps Scoops trading cards squeeze about 1,000 years of history into a tidy 156-card set. Presented as a newspaper of sorts, the set's wide-ranging subject matter still appeal to collectors today. Released in a two series, each with 78 cards, 1954 Topps Scoops are much smaller than traditional trading cards. Each measures 2 1/16" by 2 15/16". Card fronts have a painted image of the event along with a box that carries a headline and date. Some cards originally came with scratch-off area meant to hide the image. Card backs are laid out like a newspaper. The top of the card has a newspaper name, date and location. The card number inside a box on the left side. Below this is a headline. A black and white image and a write-up tell the story. The subject matter in 1954 Topps Scoops covers a lot of ground. Early American history and recent wars figure very prominently. Although the release focuses heavily on non-sports subjects, it isn't without a handful of sports stars. 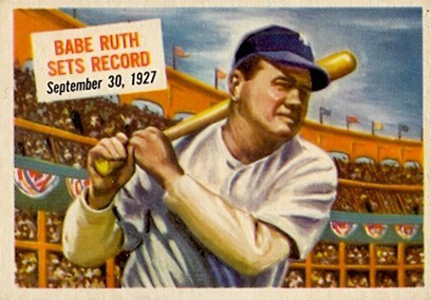 Babe Ruth, Notre Dame's legendary Four Horsemen, Jesse Owens, Joe Louis, Bob Feller and Ben Hogan are among the athletes included in the set. Today, 1954 Topps Scoops appeals to a variety of collectors. Besides set collectors, the varied subject matter brings a lot of interest for singles as well. Not surprisingly, the Ruth generates some of the highest prices. 1954 Topps Scoops Complete set 156 cards Babe Ruth,Hogan, Owens,Four Horsemen. I have a full set I’d like to sell…ungraded…many in great condition. Any interest? If so send me an email and I’ll reply. I have a complete set of 1954 Scoop vintage cards, mostly in v.g. to excellent condition. What is it worth approximately and where could I sell it? Nice write up Ryan. Be advised that not all Scoops cards came with the rub-off bars. There was only one of those per five cent pack. The other cards were clean. I am looking for a full set of 1954 Scoop vintage cards. I have a complete set. Make an offer, in varying quality from fair to excellent. I have a complete set at V.G to excellent condition. Willing to sell it. As a child I was given a set of Scoop cards. They are all in very good condition. I am now 74 and would like to sell them, or at least the ones that are in demand. Counting them, there are 83 so not a complete set but I may have cards of interest to a buyer. I want to sell them. I have 135 cards out of set and some additional duplicates. Two are marked but remainder are generally good. Will send list and specific photos on request. I have a full set and some duplicates. All in VG to XCELLENT. WILL SELL. I am not a collector. I’m just interested in getting all 156 scoop cards. I had The cards as a kid. I don’t know how to make a bid— fair market value figures are hard to determine in this area. I wouldn’t mind hearing what values are being talked about.